Video of a crown flash in Russia. 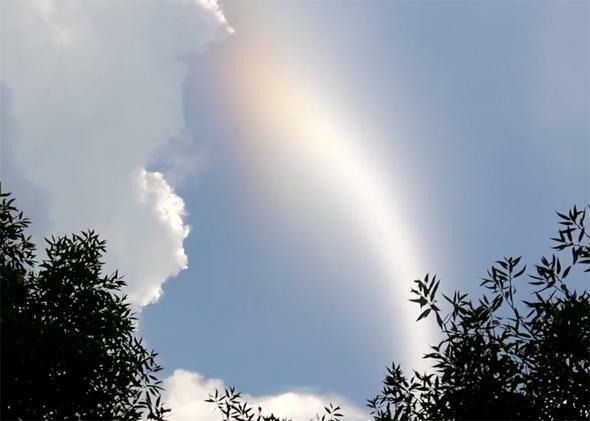 A crown flash/jumping sun dog, seen in Russia, just before a lightning flash made it sweep across the sky. Just recently I wrote about one of the coolest and weirdest weather/optical phenomena I’ve ever seen: crown flashes, also called jumping sun dogs. They’re streamers of light above storm clouds that appear to dance and flash, sometimes quite rapidly, looking like search lights or huge light sabers. They’re almost certainly caused by long ice crystals above the cloud that align themselves with the cloud’s electric field. If you see them from the right angle, they bend (or refract) the sunlight toward you, causing the glow. When lightning erupts from the cloud to the ground (or inside the cloud) the electric field changes radically, realigning the ice crystals. When this happens they suddenly bend sunlight in a different direction, causing the glow to shift. The video was taken in Zvenigorod, a city in Moscow Oblast in Russia, on July 3, 2016. It really shows a lot of detail, and I gasped out loud at the 1:25 mark when it shows the glow sweeping rapidly like the blade of a sword into a new position. I have some mixed feelings about this, to be honest: While this is one of the most astonishing optical phenomena I’ve ever seen, the things is, I’ve never seen one for myself. I recently was able to scratch Kelvin-Helmholtz clouds off my “to see” list, as well as (yikes) a tornado. But this? Crown flashes are pretty rare; besides having the ice crystals aligning correctly you also have to be in the right spot for the geometry to line up, otherwise the sunlight isn’t bent your way. They’re rare enough that I hadn’t even heard of them until a couple of years ago. It seems unlikely I’ll ever witness one. Ah well. I can add that to a long list of things still to witness (like a total solar eclipse, a full-blown aurora, a display of undulatus asperatus, and more). I do get around, and I do tend to look up, so I can still hope. There are a lot of truly wonderful things to experience on this planet of ours.